On one hand, the knee must be very supple and flexible in order to perform both horizontal and vertical movement; on the other hand it must be strong and resistant to the overload, since it bears the whole body weight during walking. The strongest muscle of the knee joint is the quadriceps muscle, which serves as the main stabilizer. The knee joint socket consists of the slightly concave condyles of the tibia and the articular surface of patella, whereas its head is formed with the convex condyles of the femur. The two discs, called menisci, are located in the knee joint. They serve to integrate the articular surfaces during movement. Mechanically, they belong to the ginglymoid joints, which enable flexion and extension, as well as the rotation when the joint is flexed. 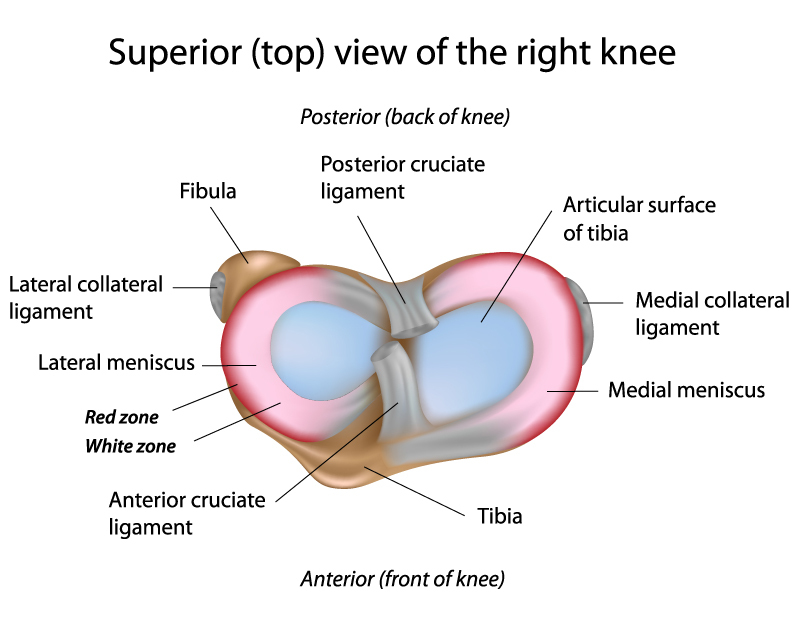 The knee is the largest joint in the human body and is exposed to the greatest loads. Therefore, it should be cared for by proper supplementation of low levels of synovial fluid and nourishing articular cartilage. Anterior cruciate ligament - limits the excessive flexion, extension and it protects valgus knee (Genu valgum ) and varus knee (genu varum) from deformity during the knee movement. The muscles pay a major role in producing and controlling movement, and they also serve as active stabilizers. The Quadriceps femoris muscle is particularly important as the powerful extensor of the knee joint and its stabilizer on the saggital plane. Its main antagonists, that is, the hamstring muscles, are the biceps femoris and the semitendinosus and semimembranosus muscles which extend the knee. One of the most common injuries are the injuries of the knee ligaments, resulting from twisting. They may occur along with other damages to the body as a result of so called multiply injuries. One of the consequences of the ligament injury is the loss of the knee stability. The knee instability is the condition when, as a result of injury, the knee shows the excessive mobility as compared to the physiological state. Most commonly, the injury occurs in anterior cruciate ligament which constitutes the large part of the major elements responsible both for the knee stability and for the prevention of the anterior displacement of the tibia relative to the femur. The damage to this structure leads to the serious disorders of the gait and walking pattern, caused by the atrophy of the Quadriceps femoris muscle and the impairment of the knee-locking mechanisms. Also, the disturbance in the deep sensation appears as one of the syndromes. Characteristic crunching in the knee represents a disorder in its functioning. It is advisable report to a specialist immediately to determine the source of these ailments. The menisci are exposed to injuries mainly as the effect of the uncontrolled twisting or turning of the shank with the flexed knee joint. It mostly occurs during sport activities (skiing, football, volleyball), while performing the physical work (the injury of the lateral surface of the knee joint) or even as a result of the trivial housework ( rising from the squatting position). 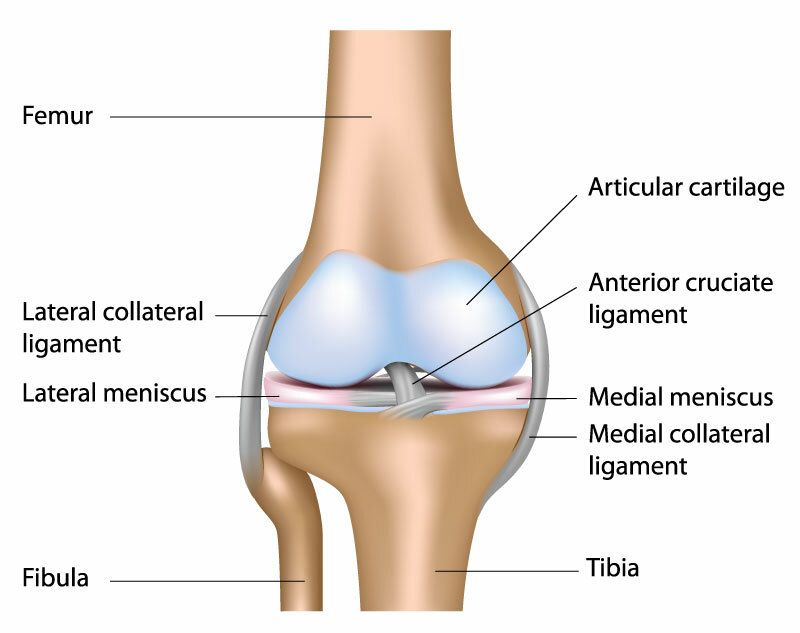 Moreover, the knee instability caused by the cruciate ligaments injuries may predispose to the meniscus tear. The injuries that can occur to the articular cartilage are often the result of the knee instability, and they frequently follow the meniscus tear. Also, the damage of the articular cartilage is often associated with the intra-articular fractures of the knee and other knee contusions (bruised knee). rheumatoid diseases and other conditions. One of the most detrimental factor contributing to the articular cartilage disorders is overweight. the transverse tarsal joint which connects the talus bone with the calcaneus and the navicular bones- this joint, in turn, allows the inversion and eversion movement of the foot. The foot reaches three degrees of freedom of movement, like in the enarthrodial joint, by the combined effort of the talocrural joint and the transverse tarsal joint. on the medial side (superficial and deep of fibres)on the lateral side the anterior tibiofibular ligament (ATFL), calcaneofibular ligament (CFL), posterior tibiofibular ligament (PTFL) are located. All these elements are surrounded by shin muscles, which actively stabilize the ankle joint. This joint is extremely exposed to traumatic injuries during sports, so the injuries of the ankle are the most common ones in numerous sports. By supplementing the basic ingredients that build the joints, that is hyaluronic acid and chondroitin sulphate, we ensure maintaining them in a healthy condition for longer. The higher the concentration of ingredients, the better the effect of using supplementation. The most common injury of ankle is an excessive inversion - colloquially speaking, the twisted ankle or the sprained ankle. It is usually the result of incorrect putting the foot on the ground. The damage of the ligamentous--capsular apparatus mostly refers to the lateral stabilizers of joint, and it often occurs when the leg hits the ground on the outer edge of foot (so called supination-adduction mechanism). It comprises 85% of all injuries of joint. The damage of medial side is caused by the foot forcefully hitting the ground on the inner edge of foot - the pronation-abduction mechanism. This injury commonly occurs in footballers. Inflammation of the plantar fascia - is often seen in athletes practicing the discipline associated with running or long-distance gait. The causes of the inflammation of the fascia can be the repetitive micro-injuries of tendons and nerves associated with the heel hitting the ground. It may be followed by the occurrence of degenerative changes. Hallux valgus - also known as halluksy, mostly affects adults, especially women. This is the deformation of the foot, resulting in the finger deviating towards its outer edge and the metatarsal bone deviating on the inner side. Deformation arises in the form of cosmetically disturbing bulge (bunion) This is often the cause of unpleasant symptoms (such as burning, tumefaction , pain). Halluksy, when untreated over time, may cause problems with mobility, in addition to the difficulties in selecting the appropriate footwear. Morton’s neuroma - This is a disease manifested by pain of common plantar digital nerves. The disease is caused by the pressure of the plantar nerve innervating the toes which passes through the transverse metatarsal ligament. Hyalutidin HC Aktiv contains 15000mg of components building the joints, that is hyaluronic acid and chondroitin sulphate. In addition, the liquid form provides absorption in the range of about 100%.